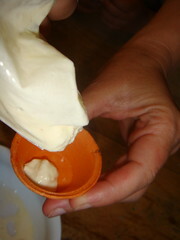 We have made ice-cream before on this blog and nearly all our birthday cakes are made from ice-cream, but what about this: Ice-cream in a ziplock bag? Believe it or not? This one sure has the WOW-Factor. 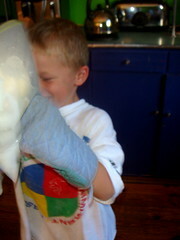 I found it in Family Fun years ago and tried it with limited success (I didn’t use enough ice!) but then I watched this movie from instructables, and if you can get past the vegetable marketing, it gives a great demo. 1 cup of granular salt. 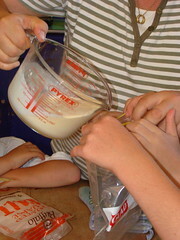 Step 1: Mix together the cream, vanilla essence and castor sugar in a jug. 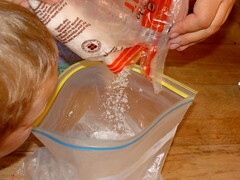 Step 2: Pour into the smaller ziplock bag and seal it shut. 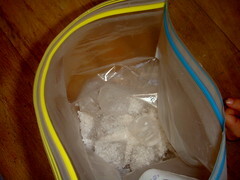 Step 3: Fill your large ziplock with ice. 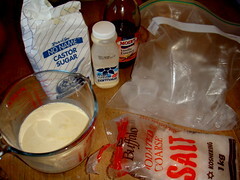 Step 4: Add the salt to the ice. 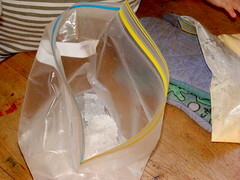 Step 5: Pop your small sealed bag of ice cream mixture into your large bag and seal the large bag too. 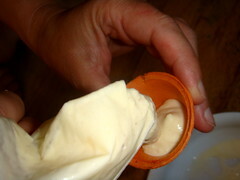 Step 6: Now you are ready to shake, rattle and roll. Some people come better prepared than others! 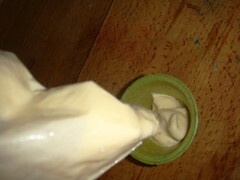 Step 7: Between five and ten minutes of the great shake you will have some delicious soft serve. Which didn’t last long enough for a glamorous picture.